Sun., Oct. 8, 2017, 7 a.m.
A speeding bicyclist has taken away something dear to Virginia Pearsall. 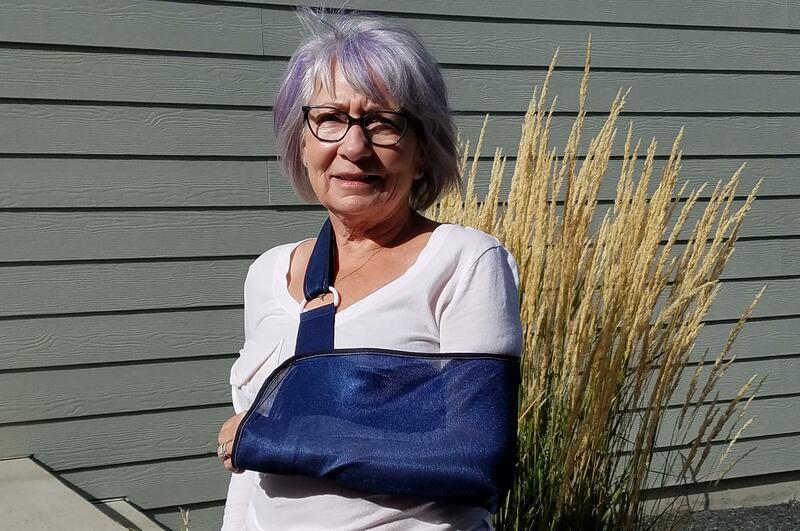 “I can’t feel safe on the trail anymore,” said the 67-year-old Spokane woman on Friday walking with a slight limp and her left arm in a sling. The Spokane River Centennial Trail running through Kendall Yards was a major attraction for Pearsall and her husband to move into the development overlooking the Spokane River Gorge. “I didn’t know what that meant, but I thought it might be a bicyclist,” she said. Her dog, Rags, was on leash just in front of her and her sister was by her side. They were taking up less than half of the paved trail, she said. “I was going to step onto the grass to get even farther off the trail when something hit me like a Mack Truck on the back of my leg and slammed me to the ground,” she said. The cyclist landed on top of her and then he went into a tirade, she said. Pearsall was taken to a hospital emergency room where she was examined for severe bruising and knee damage and diagnosed with a fractured elbow. Cyclist Justin Haller, 44, of Spokane said he went to an urgent care where he learned that he broke his nose and rebroke a bone in a hand that was still healing from previously being broken in a glancing collision with a vehicle. “The woman who was hit wasn’t taking up much space on the trail at all,” said Amanda Jones, who was with two other moms and their toddlers at the park playground. “Two of us were on the trail as he went by and we saw the whole thing from about 50 yards away. The left side of the trail was wide open. “After he hit her, he didn’t even ask if she was OK. He just started yelling and swearing at her. I ended up walking over and told him twice to stop yelling at her. Pearsall said she filed a report with Spokane Police Department, “but was told they couldn’t charge him with anything.” SPD officials did not immediately return a reporter’s call to confirm that. But Pearsall said she can’t forget the incident. “I have at least 14 weeks of recovery ahead of me,” she said. “If it had been one of those kids, we might be going to a funeral. Pearsall said she’s talked to a number of walkers who have had close calls with bicyclists and even runners on the Centennial Trail. “I know walkers aren’t perfect, that they take up the trail and aren’t paying attention sometimes, but when you get plowed over at the edge of the trail something’s wrong,” she said. “I hate to slow down,” Haller said when asked why he didn’t. “Most of the time people move. These people wouldn’t move,” he added noting that the moms with strollers were part of the problem, too. “I would never suggest that bicycles don’t belong on the Centennial Trail,” Pearsall said, noting that her family includes serious cyclists. “I’m going to pursue this because I really do feel he didn’t even care if he hit me. His remarks confirmed it. He doesn’t belong on a bicycle. “I want people to be aware of what is happening,” she said. “I’ll get out of a biker’s way, but when there’s doubt, pedestrians have the right of way. The Centennial trail is a multi-use recreational trail where all users have to be mindful of others, said Paul Neddo, ranger for Riverside State Park which manages the entire 40 miles of the route. “That’s why we have the 15 mph speed limit for bikes because they’re going to come across moms with strollers, and it’s why, being mindful of cyclists, we require dogs to be leashed, and not the extended leashes or 12 footers that let a dog get out in front of a bike. He offered no comment on this particular incident. Published: Oct. 8, 2017, 7 a.m.